Gina Russ, a volunteer reading coach at Stocking Elementary School, is helping a first grade student learn her vowel sounds. Russ holds up a card with a letter on it. She’s trying to see if the young girl can make the letter sound. “I am trying to help this young student understand the parts of reading and become better at them,” Russ said. Russ says a lot of students are good at one or two parts of reading when they enter first grade. “But in order to become a reader, they have to become better at all the parts and learn how to put them together,” she said. The student Russ is helping is one of eight in this first grade classroom who has a daily reading intervention as part of an individual reading plan. The idea is to get students reading at grade level by the end of the school year. A 2016 law signed by Governor Rick Snyder says schools have to provide reading interventions to students from kindergarten to third grade who test below grade level in reading. Schools also need to tell parents what their kids’ reading level is, provide at home reading plans and run reading workshops. All that to prepare for next year -- when students will have to repeat the third grade if they’re a year behind grade level in reading. Carpenter feels uneasy about the new law, but she appreciates that it has put children’s literacy to the forefront. She and other teachers at Stocking have been doing reading interventions for years. JoAnn Riemersma, the principal at Stocking, says the biggest change the school has made due to the law this year is increased parent involvement. “Probably what’s moved us the most since the law is our understanding that it takes more than just the school, and the teachers and the principal and the students. It takes community and family in order to really move some of these kids,” Riemersma said. Rachel Peterson has two kids at Stocking, and she says she has some anxiety about how the new law might affect her second grade son. “The fact that if he’s not exactly where the state thinks he needs to be, then they’re going to hold him back,” Peterson said. Both of her kids are on individual reading plans, so Peterson has them read to her regularly to witness their progress. 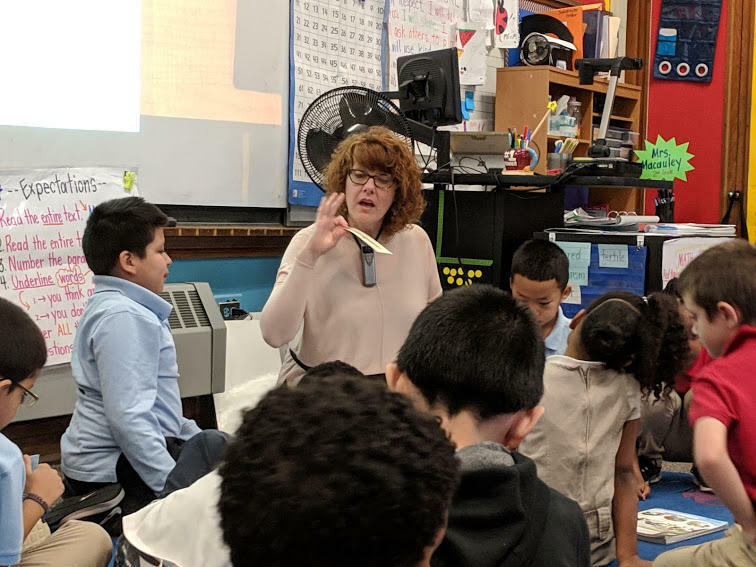 “I’ve also started asking them questions about the book when they’re done with the book because I feel like if I don’t do that then I don’t think they’re actually comprehending the book, I think they’re just reading the words,” she said. Peterson admits that the new law caused her a little worry initially, but she appreciates knowing what she has to do at home to help her kids become better readers. “It’s worked really well for my kids so far. They’ve excelled and they are all doing really well from what I’ve heard from their teachers. They seem to be doing really well at home, they are moving up in their reading levels, and so I think it’s a good thing to have in place,” she said. The new law requires schools to update parents on their kids’ reading progress three times a year, but teachers at Stocking say they don’t need a state mandate to do that. Rachel Peterson gets more frequent updates to make sure her kids are on track. LANSING, Mich. (AP) - Gov. Rick Snyder and lawmakers are making third-graders' reading proficiency a significant focus this year. They have unspecified plans to improve kids' literacy long before they're 8 or 9 years old. But it remains unclear how far policymakers will go to deal with students who still aren't reading well enough by the end of third grade.